“In essence it was a class war” - George Orwell reflects on his experiences as a volunteer militiaman in the Spanish Revolution and Civil War. Written in 1943. In connection with what I have just said, a footnote, on atrocities. Well, a few weeks later at the front I had trouble with one of the men in my section. By this time I was a ‘cabo’, or corporal, in command of twelve men. It was static warfare, horribly cold, and the chief job was getting sentries to stay awake at their posts. One day a man suddenly refused to go to a certain post, which he said quite truly was exposed to enemy fire. He was a feeble creature, and I seized hold of him and began to drag him towards his post. This roused the feelings of the others against me, for Spaniards, I think, resent being touched more than we do. Instantly I was surrounded by a ring of shouting men:’ Fascist! Fascist! Let that man go! This isn't a bourgeois army. Fascist!’ etc., etc. As best I could in my bad Spanish I shouted back that orders had got to be obeyed, and the row developed into one of those enormous arguments by means of which discipline is gradually hammered out in revolutionary armies. Some said I was right, others said I was wrong. But the point is that the one who took my side the most warmly of all was the brown-faced boy. As soon as he saw what was happening he sprang into the ring and began passionately defending me. With his strange, wild, Indian gesture he kept exclaiming, ‘He's the best corporal we've got!’ (No hay cabo como el.) Later on he applied for leave to exchange into my section. To say this is not to idealize the working class. In the long struggle that has followed the Russian Revolution it is the manual workers who have been defeated, and it is impossible not to feel that it was their own fault. Time after time, in country after country, the organized working-class movements have been crushed by open, illegal violence, and their comrades abroad, linked to them in theoretical solidarity, have simply looked on and done nothing; and underneath this, secret cause of many betrayals, has lain the fact that between white and coloured workers there is not even lip-service to solidarity. Who can believe in the class-conscious international proletariat after the events of the past ten years? To the British working class the massacre of their comrades in Vienna, Berlin, Madrid, or wherever it might be seemed less interesting and less important than yesterday's football match. Yet this does not alter the fact that the working class will go on struggling against Fascism after the others have caved in. One feature of the Nazi conquest of France was the astonishing defections among the intelligentsia, including some of the left-wing political intelligentsia. The intelligentsia are the people who squeal loudest against Fascism, and yet a respectable proportion of them collapse into defeatism when the pinch comes. They are far-sighted enough to see the odds against them, and moreover they can be bribed — for it is evident that the Nazis think it worth while to bribe intellectuals. With the working class it is the other way about. Too ignorant to see through the trick that is being played on them, they easily swallow the promises of Fascism, yet sooner or later they always take up the struggle again. They must do so, because in their own bodies they always discover that the promises of Fascism cannot be fulfilled. To win over the working class permanently, the Fascists would have to raise the general standard of living, which they are unable and probably unwilling to do. The struggle of the working class is like the growth of a plant. The plant is blind and stupid, but it knows enough to keep pushing upwards towards the light, and it will do this in the face of endless discouragements. What are the workers struggling for? Simply for the decent life which they are more and more aware is now technically possible. Their consciousness of this aim ebbs and flows. In Spain, for a while, people were acting consciously, moving towards a goal which they wanted to reach and believed they could reach. It accounted for the curiously buoyant feeling that life in Government Spain had during the early months of the war. The common people knew in their bones that the Republic was their friend and Franco was their enemy. They knew that they were in the right, because they were fighting for something which the world owed them and was able to give them. The other memory is of the Italian militiaman who shook my hand in the guardroom, the day I joined the militia. I wrote about this man at the beginning of my book on the Spanish war (Homage to Catalonia), and do not want to repeat what I said there. When I remember — oh, how vividly! — his shabby uniform and fierce, pathetic, innocent face, the complex side-issues of the war seem to fade away and I see clearly that there was at any rate no doubt as to who was in the right. In spite of power politics and journalistic lying, the central issue of the war was the attempt of people like this to win the decent life which they knew to be their birthright. It is difficult to think of this particular man's probable end without several kinds of bitterness. Since I met him in the Lenin Barracks he was probably a Trotskyist or an Anarchist, and in the peculiar conditions of our time, when people of that sort are not killed by the Gestapo they are usually killed by the G.P.U. But that does not affect the long-term issues. This man's face, which I saw only for a minute or two, remains with me as a sort of visual reminder of what the war was really about. He symbolizes for me the flower of the European working class, harried by the police of all countries, the people who fill the mass graves of the Spanish battlefields and are now, to the tune of several millions, rotting in forced-labour camps. Ditto, though it contains a partial truth, with all the talk about the worthlessness of social reconstruction not accompanied by a ‘change of heart’. The pious ones, from the Pope to the yogis of California, are great on the’ change of heart’, much more reassuring from their point of view than a change in the economic system. Petain attributes the fall of France to the common people's ‘love of pleasure’. One sees this in its right perspective if one stops to wonder how much pleasure the ordinary French peasant's or working-man's life would contain compared with Petain's own. The damned impertinence of these politicians, priests, literary men, and what-not who lecture the working-class socialist for his ‘materialism’! All that the working man demands is what these others would consider the indispensable minimum without which human life cannot be lived at all. Enough to eat, freedom from the haunting terror of unemployment, the knowledge that your children will get a fair chance, a bath once a day, clean linen reasonably often, a roof that doesn't leak, and short enough working hours to leave you with a little energy when the day is done. Not one of those who preach against ‘materialism’ would consider life livable without these things. And how easily that minimum could be attained if we chose to set our minds to it for only twenty years! To raise the standard of living of the whole world to that of Britain would not be a greater undertaking than the war we have just fought. I don't claim, and I don't know who does, that that wouldn't solve anything in itself. It is merely that privation and brute labour have to be abolished before the real problems of humanity can be tackled. The major problem of our time is the decay of the belief in personal immortality, and it cannot be dealt with while the average human being is either drudging like an ox or shivering in fear of the secret police. How right the working classes are in their ‘materialism’! How right they are to realize that the belly comes before the soul, not in the scale of values but in point of time! Understand that, and the long horror that we are enduring becomes at least intelligible. All the considerations are likely to make one falter — the siren voices of a Petain or of a Gandhi, the inescapable fact that in order to fight one has to degrade oneself, the equivocal moral position of Britain, with its democratic phrases and its coolie empire, the sinister development of Soviet Russia, the squalid farce of left-wing politics — all this fades away and one sees only the struggle of the gradually awakening common people against the lords of property and their hired liars and bumsuckers. The question is very simple. Shall people like that Italian soldier be allowed to live the decent, fully human life which is now technically achievable, or shan't they? Shall the common man be pushed back into the mud, or shall he not? I myself believe, perhaps on insufficient grounds, that the common man will win his fight sooner or later, but I want it to be sooner and not later — some time within the next hundred years, say, and not some time within the next ten thousand years. That was the real issue of the Spanish war, and of the last war, and perhaps of other wars yet to come. George Orwell: ‘Looking back on the Spanish War’ First published: New Road. — GB, London. — 1943. ‘England Your England and Other Essays’. — 1953. ‘Such, Such Were the Joys’. — 1953. 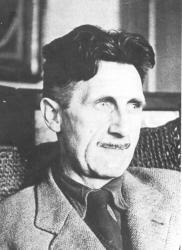 ‘The Collected Essays, Journalism and Letters of George Orwell’. — 1968.